Folks 1 Sale a Day, has the Ninja Master Pro Prep for only $29.99 today!!! This is a $119.00 item, what a deal! The Holidays are right around the corner and the Ninja is one very useful gift, it's BPA free too! 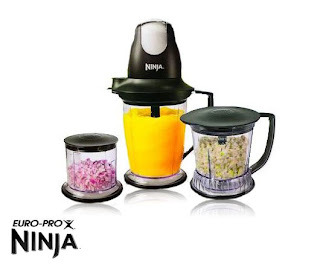 In my Ninja I make hummus, it's great for crepe batter, use it for easy fresh salsa, perfect for smoothies or blending up soups and sauces- I can go on for days. I will say the quality of the parts is so-so, the plastic on one of my blades began peeling after just a few uses. Luckily, my set came with three different blades so now I'm down to two. At $29.99 this is sale you won't want to miss! P.S.- I'm not here to advocate for 1 Sale a Day but when I see deal, it's my job to let you know!